We enjoy the beautiful full moon of september. Special sweets called ''Ohagi'', moo-viewing dumplings and ''susuki'', Japanese pampas grass are offered to the moon. The moon was thought to be one of the gods. 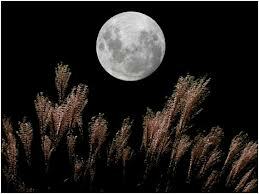 Moon viewing was originally a farmers' event, who pryed for a good harbest at the beginning of the harvest season.